Ever since I got here, ATG has intentionally paid wages late (if at all) as some sort of passive-aggressive “don’t forget who’s boss” tactic. This has resulted in almost weekly arguments with them that eventually leads to Ibrahim shouting at his staff and telling them to get us paid “immediately”. If we don’t remind them, they do nothing. They say nothing. No apology. No explanation. Nothing. It’s pathetic. Before coming to Doha, the UK crew sent Abdul a list of expectations. One of them stated that instead of all UK crew getting paid based on their arrival date on the job, we all get paid the same day. For example, my pay day was Tuesday. Smithers’s and Ray’s was Monday. I’m not even sure when the rest were meant to be paid. The intention behind our idea was that if we were all to be paid the same day, ATG couldn’t hide behind the complexity of payment dates. The list was ignored. However, about a week later, Abdul sent out an email suggesting we all get paid at the same time. So apparently it was his idea!!! Anyway, everyone humoured him, pretended it was his idea and we all agreed it was a fabulous idea of his that we all be paid Saturday. As a result, it was agreed that we should all submit our invoices up to that date so that our wages could be cleared in full for Jordan before the move to Qatar. We have now been in Qatar for a week. And we have not been paid. Smithers, Ray and I are now owed three weeks wages. Andrew McEwan is now owed four weeks wages. Chris Richmond is owed about six weeks wages. Simon Hunter is owed two months wages. Now Abdul may be owed four months wages but there is a difference of sorts. We always tell ATG to pay up. He does not. So when Simon and Chris went to him last Wednesday and had an argument with him about their late wages and he laughed, he did not get our sympathy. He has been paid in full. He has been put up in a better hotel. We are on strike. Sort of. So we are working. But in our rooms. And we are not sharing the ‘fruits of our labour’ with them. We had to make the point that any problems that occur as a result of not talking to them would be their fault because we know the first thing ATG would do is say we are “ambushing the project”. They are extraordinary. I have never come across a more obtuse self-righteous arrogant cold bunch of people in my life. Omar looked genuinely wounded when I shouted at him about a month ago because he thought it was funny when he said we’d (maybe) get our per diems on the following Sunday despite the fact they should have been paid already. How stupid can people get? Anyway, it is now 10:30am on Saturday and we have not heard from ATG yet. They’re likely going to call our bluff. Ignore us and see what we do because, ironically, our per diems are supposed to be paid today. But I have said to Ray and Andrew that we should not chase up our per diems. We are owed them. That’s a fact. And if we go to collect them ATG will use that to make them look like the good guys and us look like the bad guys. They are not simple-minded. So I said let them bring our per diems to us without us bothering to remind them. After all, we should not have to remind them. Tomorrow, we shall send out a second email stating that from now on wages must be paid on the day they are owed or we will not come into work the next day. By then we shall all be owed last week’d wages too. As a footnote, word has it ATG received a $5 million payment from the Studio after Talal got back from Doha. So it’s not like they are short of cash. 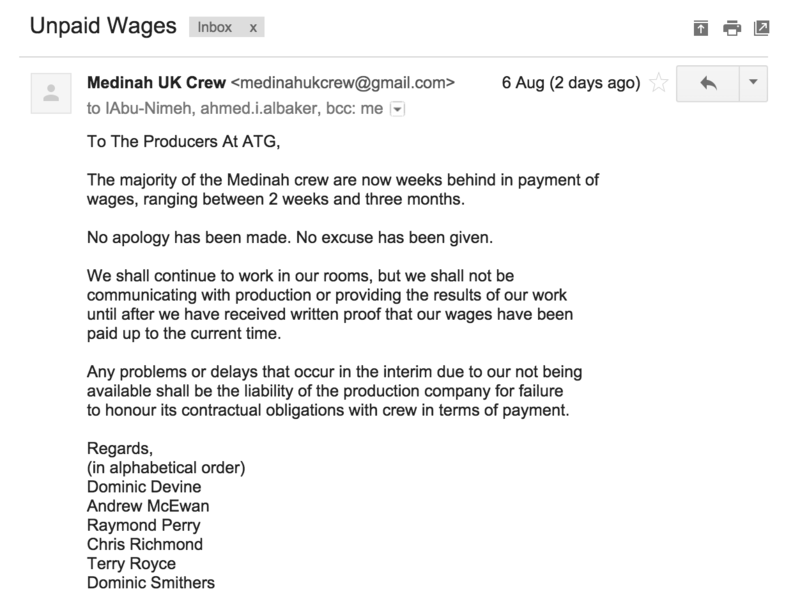 This entry was posted in Production Dept, Unpaid Wages Battles (2015), Us & Them and tagged andrew mcewan, atg, chris richmond, dominic smithers, investors, per diems, ray perry, simon hunter, strike, talal al awamleh, the studio. Bookmark the permalink.